Fiona Brooke, SARRAH Director Policy and Evidence at the Indigenous & Remote Health Conference. Thank you for your kind welcome today. Before I begin, I wish to acknowledge the Turrbal, Jagera and Yugara people whose land we are meeting on and pay my respects to their elders past, present and emerging. I am with SARRAH – the peak body for allied health professionals in rural and remote communities. Some of you may know about SARRAH. We have been around for over 20 years. For a large slice of that time, we were delivering scholarship programs for allied health professionals. While this is still part of who we are, we are also engaging more deeply in the delivery of services to support allied health professionals and looking at ways to support effective training of the rural and remote allied health workforce of the future. I am trying to start a conversation with you about how we can do specialist outreach better for the benefit of all. I want to present my ideas to you as a challenge. I know we can do outreach better. We have to start talking about what better outreach looks like and how better outreach is planned for, delivered and funded. How can we ensure positive experiences for these health professionals? How do we ensure their skills mix is appropriate to the issues they will meet? How do we vest greater ownership of outreach with communities? Is there a toolkit for outreach service provision? Should there be one? At the heart of these questions is one simple question – who is outreach for? If it is communities, then that has to move to front and centre in our thinking – particularly how the services support communities and how health professionals ensure communities get not just the services they need, but the better health outcomes they seek in inviting those services into their community. Outreach services are one of the models of service that have been developed to address significant health care access issues in rural and remote Australia. The original Commonwealth outreach program was the Medical Specialist Outreach Assistance Program – MSOAP – which I managed for several years and which I designed and led a review of in 2011.
promoting shared care between primary (local) and specialist (outreach) providers. While the report was able to show improved access to health services, what was, and still remains missing is the ability to translate that improved access into improved health outcomes for communities. The research on this is very limited – and indeed very recent evidence suggests that the outcomes are mixed with a recent report showing the ‘blitzes’ dealing with cataract surgery may create as many problems as they fix in terms of working towards consistently better access. The report considered some of the alternatives to outreach care, including patient assisted travel, telemedicine and ‘primary care only’ care. In practice these modalities are not direct substitutes, and a mix of approaches for improving access is feasible. The review concluded that in general, outreach specialist care represented a cost effective alternative to patient assisted travel to access specialist services in cities. Not bad, but we should be able to do better. Outreach is an expensive business. At what point do we find that supporting a more permanent solution may be more cost-effective? Getting decision-makers to comprehend what primary – let alone preventive – care encompasses would be a really good outcome. I had hoped that in commissioning the review of MSOAP, the replacement RHOF would go on to build in requirements to measure and report on the impact on health outcomes. But from the current Budget documents, measurement is still confined to the number of occasions of services and the number of communities supported. If the focus is on through-put, these are effective measures, but if you want to make a difference and improve health outcomes, these measures aren’t worth the paper they are presented on. This really isn’t acceptable. In my view, outreach services, or those who manage them, should be required to demonstrate changes in health outcomes, or at least demonstrate reduced rates of hospitalisation or emergency evacuation and should be accountable to the communities and people they serve. This should require baseline measures of health prior to the introduction of outreach services in a community followed by long term monitoring of changes in those outcomes. And this should be reportable not only to governments, but to the communities being served. And community views of the service must be part of their annual review. I don’t want to dwell on this too long, because I want to talk about how to provide better options to people living in remote and very remote communities and produce better health outcomes. And part of this discussion should also focus on how communities achieve the best outcomes from services. And these objectives – better outcomes for communities and more positive experiences for outreach workers – are inextricably linked. Outreach workers who are well prepared and who feel they’re making a difference approach service delivery positively and engage better with communities. So how do we set up Outreach health professionals for positive experiences? A key factor is in preparing them well so they know what to expect and have a chance to establish important community relationships ahead of working in the community. Another factor for success is to support good coordination and assistance in each community. Too much outreach is poorly coordinated and the result is that the community does not gain the potential benefits and outreach workers come away disappointed. Adequate funding needs to be available to support the level of coordination in terms of the people on the ground in remote and very remote communities. We need to consider how we vest ownership of outreach in communities and at which point we recognise that having an additional health professional, working to an expanded scope of practice with back up telehealth support may be a more effective solution. I want to unpack these concepts now. In terms of how we prepare outreach workers better, if you are working in the rural and remote health sector, you would be well aware of the push for Rural Generalist doctors and the potential changes that this model of practice offers in terms of GPs who are better equipped to work in rural and remote communities. But we also need to encourage greater knowledge and expertise in rural health for other medical specialties. Rural generalism is also being taken up more broadly. The term rural generalism is being widely used at the moment, but isn’t necessarily well understood. At the heart is the concept is to provide health professionals with additional skills to enable them to work to an expanded scope of practice in a rural or remote community. This may mean, for an allied health professional, that a dietician undertakes additional training and mentoring enabling them to work more effectively with Aboriginal people in educating them in the health impacts of diabetes and in developing mechanisms to support access to a better diet making management of their condition easier for the person, their carers and family. For a Physiotherapist, it may mean undertaking additional training in paediatric physiotherapy to respond to a higher level of need in their local community. The education program linked to allied health rural generalism includes options to enable allied health professionals to develop better skills for rural and remote practice, but also to explore specialist allied health skills that may be necessary in their local community. In allied health, Queensland Health is leading the way in developing and supporting broader skills development across seven allied health professions – physiotherapy, pharmacy, occupational therapy, radiography, nutrition and dietetics, speech pathology and podiatry. SARRAH has been working with Queensland Health and James Cook University to promote Allied Health rural generalism nationally. To date, in addition to the placements in rural and remote Queensland, several trials have been implemented in New South Wales, Western Australia and the Northern Territory, and Tasmania is also about to implement several training positions. The academic program targets two groups, new and recent graduates who are offered a two-year part time course integrated into their employment, and more established practitioners who can undertake a one-year course. At the completion of the education program, graduates receive a Graduate Diploma in Rural Generalist Practice. Increase their career options and advancement. It does this through work integrated development - practical on-the-job projects, and the use of online modules. This form of enriched training and practice is one of the means of equipping health professionals for rural and remote practice – whether outreach or not. 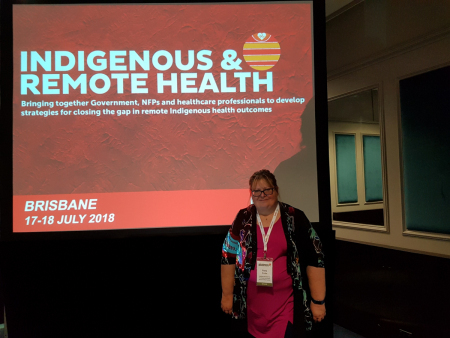 And certainly training in Aboriginal and Torres Strait Islander health and cross cultural practice is vital for all health professionals seeking to work in remote Indigenous communities. For me, the most crucial and often overlooked factor in making the best of outreach services for everyone is in the on-the-ground coordination. This not only means making sure local health providers know which outreach providers are coming and when, but that the people who need to see these workers know they will be there and that they have the support they need to attend – whether it is transport, a carer or family support. It sounds so simple but it is surprising how often it is just not done, or not done well. continuity of care, improving community access and in supporting follow up is invaluable. And how to do this better came from the experience of not for profit providers working without government assistance – such as the Fred Hollows Foundation – and university-led programs – such as run by the University of Melbourne. And now I want to turn to how we vest ownership of outreach differently. Under the current program, specialist outreach is a government program and ownership is vested in government and the outsourced providers. Yes, these providers are required to consult with communities about needs, but at the end of the day, the community receives the services they are allocated. Outreach services have been out-sourced programs from inception and have developed a range of evidence based evaluation tools to assist them in allocating and prioritising needs. How can we do this differently and give communities greater ownership of the services they receive? This could also apply to services commissioned by Primary Health Networks to address gaps in services. Why not allocate funding at regional or community level based on need and then work with communities to determine what services the community wants and the way in which those services are to be delivered and supported? How do we determine need against which we allocate funding? The first step is to improve the data at local levels. We need all the local health providers to work together to develop a community profile that recognises the range of local needs – both met needs and unmet needs. With improved, quality data at community level, we could construct a formula that links age and gender community profiles, remoteness areas and morbidity and mortality. From this we could construct an index of need – this could link to clinical management plans that describe the clinical care needed for the conditions identified and the most effective means of addressing those needs. For example, a team of nurses and allied health professionals working together able to source a general practitioner and specialist through telehealth. From this, communities should be allocated a notional budget for health services to supplement existing services, with the level of funding guaranteed for five years and with appropriate recognition of the additional costs in supporting remote access. Communities can then work with local providers, their local PHN or existing outreach service providers to determine the service mix they want, to address their local needs, with priorities having been determined at the local level. Communities orient the new service providers and health professionals to their community, train them in the local ways and work with them to deliver outreach to the community over the five year period, enabling relationships to build and gaining a stable support system for the outreach workers. During the period of the contract, the community and service providers work together to examine how/whether they can make their service sustainable in the long term and monitoring the changes in health and wellbeing over the period, fine-tuning where necessary. And inherent in this approach is looking locally to develop their future workforce. There will be opportunities for employment as health professionals or assistants in health, aged care, disability care and childcare. This needs to be included in the plan for long term sustainability, with training offered locally. Which brings me to the last portion of my talk: about whether a Toolkit is useful for specialist outreach. In preparing for this talk, I looked at the information provided for outreach workers on the websites of the Rural Workforce Agencies and the Department of Health. I was wondering whether this was an issue that they had considered and if so what they had made available. Every State/Territory has different resources, some are indeed very extensive, while others are, well, not. The Commonwealth Department of Health provides the guidelines that are used to administer the outreach programs. State Departments do the same for their outreach services. Health professionals have a wide range of views about whether a toolkit is a useful approach or not. At SARRAH, we developed a toolkit to support allied health professionals moving to rural and remote practice. This has been one of the resources that is in constant use, and in the six years it has been available has generated much positive feedback. But it is also now in need of a refresh, which we are going to do. And in doing this refresh, we will be working with Indigenous Allied Health Australia, Australia’s peak body representing and supporting the growth and development of the Aboriginal and Torres Strait Islander allied health professional workforce, and with other stakeholders to update the information to reflect current practice and to also embed cultural awareness and responsiveness throughout the kit, rather than present these issues in a single stand-alone module, as it is at present. In doing this update, we are recognising that best practice must include cultural awareness and the delivery of culturally safe services, or it simply isn’t good or even effective practice. So do we need one for Specialist Outreach? My thinking is that we reference specialist allied health outreach throughout our Transition to Rural and Remote Practice kit. Become a member and join a network of allied health professionals and students in rural and remote Australia. SARRAH needs your support to increase access to health services and improve rural and remote health outcomes.